For whatever reason, we have recently seen a wave of tracking and key-finder products lately. That said, the UK team behind Lupo has built something truly remarkable. Lupo is, easily the most versatile and most useful of the key-finder type products that we have come across. The Team was kind enough to answer a few questions for us about their new product. Lupo Team: The Lupo is a multi-function Bluetooth 4.0 device that provides many more capabilities than you will have seen from other “key-finder” products, offering a range of loss-prevention options as well as the ability to find lost items. But probably the biggest difference is the inclusion of a programmable button to allow control of other Bluetooth applications (e.g. smartphone cameras and presentations), supported by an SDK to allow software developers to build their own apps on the platform, including gesture-controlled apps. After a successful prototyping phase, the Lupo is now ready for production, and the company is fundraising for this via a campaign on Kickstarter, which is already more than 70% funded. Check out the campaign details on Kickstarter. 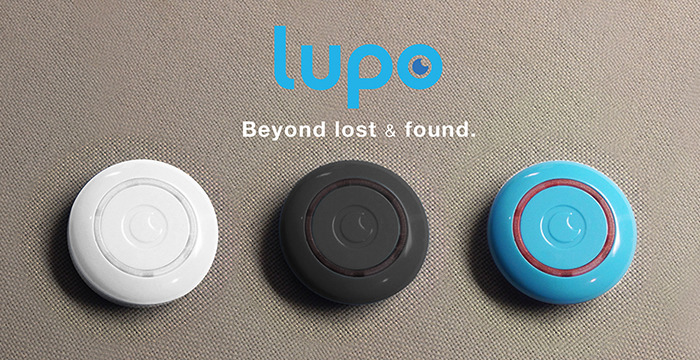 Lupo is the first device of its kind to offer “find”, “secure” and “control” functions in one tiny product. The company has received start-up awards from MIT and Nokia, and the product’s technology is based on an innovative algorithm that offers additional benefits including longer battery life and variable range settings. Lupo Team: Everyone has lost something, and loss or misplacement of any possession has more than just financial consequences, especially as more and more personal data is contained within our digital technologies. The design of Lupo is inspired by this – we wanted to create a device for everyday life that provides a simple way to find and secure our valuables, but we’ve also added the ability for Lupo to become a useful controller for any Bluetooth device. Lupo Team: We knew that power consumption of devices like this was going to be the biggest challenge. We developed a unique algorithm (patented) that allowed us to double the battery life of the Lupo when compared to other similar devices. Then we knew we had something that could really make difference! Lupo Team: The Lupo team came together after meeting at start-up events and meet-ups. Lupo Team: After our Kickstarter campaign, we will move into production. We will then focus on development of more applications that can be deployed on the Lupo platform and keep improving the SDK to support further development from the community. • Variable range settings: Lupo is the most advanced device of its kind to offer user-defined range settings for proximity notifications. • Battery performance: Lupo’s intelligent power management module ensures that the user gets the most out of the device battery. Lupo improves upon Bluetooth’s low energy performance using new hardware components, software and firmware optimisation to provide an average full year of use before the standard coin cell battery needs replacing. • Utility: Lupo does not rely only on radio signal strength (RSSI) to trigger events. This means Lupo sets with more precision to control when events are triggered (lock device, alert settings, etc.) and does not create false alerts. • A learning algorithm: The Lupo technology is designed as a learning algorithm that gets smarter and more power efficient in use. We would like to thank the Lupo Team for answering our questions. Be sure to check out their Kickstarter campaign.